Do you know about the Wellness? Surely, you do if raising feline friends for years. Offering a wide range of cat food, such brand keeps making pet parents confused with two main options, Wellness CORE vs. Complete Health. While the former focuses on protein with grain-free ingredients, the latter is an idea pick with whole nutrition for cat daily diet. Which one should be your decision, core or complete health or both of them? In the 1990s, a group of founders created the Wellness thanks to supporting of experts of nutrition for animals, vets as well as scientists. The launch brought the revolution for the pet nutritious industry as a whole. Since then, they have supplied tons of new nutritious products. Especially, not only pet food but the environment is also a focus of the brand. The Wellness makes it different with the core value towards environment representing in pet food packaging recycle. In term of cat food, healthy and tasty recipes of the Wellness are divided into two types, namely, Wellness CORE and Wellness Complete Health. Each of them features different nutrition elements contributing to contradictory discuss among cat lovers. So, it is time to learn more about these products and answer the question which one is better, Wellness CORE vs. Complete Health. 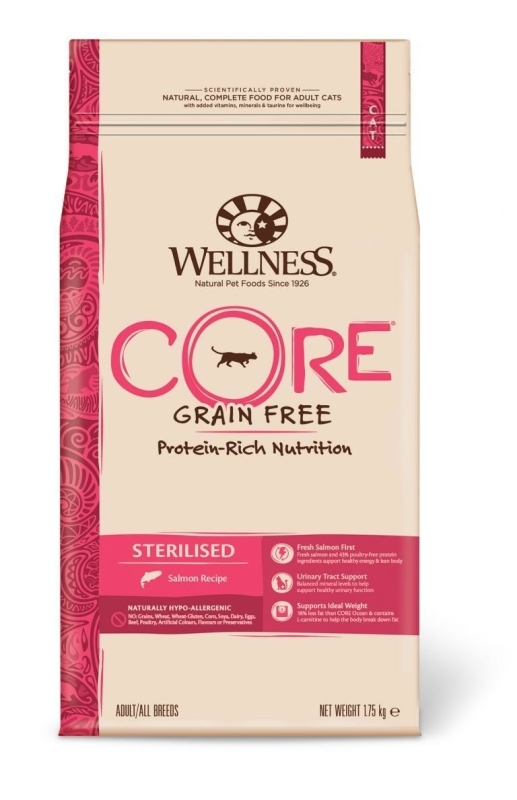 Belonging to the family of natural cat food, the Wellness CORE contains protein without grain. These products bear rich flavor of meat along with nutritious ingredients which provide cats healthy meals. Perfect combination in flavor and nutrition make the Wellness CORE delight for mealtimes of feline friends. CORE line of the Wellness includes 8 types of products. They are CORE Dry, CORE RawRev, CORE Pâté, and CORE 95%, CORE Simply Shreds Snacks, CORE Hearty Cuts, CORE Signature Selects and CORE Divine Duos. Each of them shows different outstanding features. Your cat may love it and also may not. Hence, don’t forget to observe and make the right decision. All CORE Dry packs provide cats with recipes which are rich in protein and grain-free. Main ingredients in each product are not the same. These foods supplement things that feline body need regarding probiotics, DHA and so more. Especially, some recipes can meet demands of cats which are less active and prefer outdoor things. On the other hand, with the Raw Protein, you definitely add raw to the daily cat diet. It is not necessary to waste much time preparing cat meal every day. Such pieces made of 100% pure turkey livers. They are an ideal source of protein, enzymes as along with minerals for cats. The supplement not only contributes to the creation of lean muscle, but it gains the healthy weight and brings cats shiny coat too. Additionally, the CORE also supplies tons of products with numerous source of protein as chicken, turkey, beef and salmon with deep flavor. Among options of this line, there is a special one so-called the Divine Duos. The brand makes it with two tasty layers. One is savory pâté which is covered by gravy cuts coated with sauce. Normally, servings like that will save cats from dehydration that you can easily find with dry snacks. Unlike the CORE focusing only on protein, the Complete Health of the Wellness takes the task of delivering balance in cat daily diet. It is a close link among natural proteins to supplement a full chain of nutrients needed for feline well-being. There is no problem which stages your cats are in or how healthy body they get, the Wellness designs products with recipes for each demand. Purposes of packs can be different. However, the general target of the Complete Health is to boost the healthy immune system thanks to antioxidants. Raising cats is never as easy as many people have thought. Can cats eat anything you give? No, they can. Food does not just mean food. It is a thing of wellness and nutrition for feline friends. If you afford costly products, it is highly recommended to pick the Wellness Complete Health. Such a brand is ranked as the one engaged in supplying high-quality food for pets. Having the same recipes of grain free as the CORE, the Complete Health does not contain any ingredient of gluten, for instance, wheat, barley, and rye. And, of course, it is also hard to find signs of artificial colors and flavors in this product. In the comparison of Wellness CORE vs. Complete Health, they have a similarity of grain-free. However, instead of just focusing on protein, the Complete Health line is active with formulation full of vitamins and minerals, especially good for kitten. As taking a look at the ingredient in packaging, you will see the Complete Health is not much different from your daily grocery. Thanks to this, your lovely cats will have balanced meals with full of nutrition from chicken, salmon oil and so far. You do not need to take much time setting up detailed food lists. In general, the Wellness products are available in most pet stores with various pack sizes. Because of preventing many-day-usage, you had better choose small ones. Cat food will be always new and you do not forget them till they are worse as well. Cat has a sensitive digestive system. That means you need to spend much time caring its daily diet at most. In term of the high-end cat food, it is not true to insist that there is one better in the race of Wellness Core vs. Complete Health. One side provides protein well while the other offers a full option of nutrition. Since protein plays an essential role in the cat health condition. For this point, the CORE wins. But, they also have to supplement many other nutrients. Then, the Complete Health may take advantage over. However, a mix of nutrition in the Complete Health products can cause allergy for cats. Therefore, it is a pretty need to consider before picking one to make the cat diet balanced.